I knew very little about this book when I first received it, other than what could be gleaned from the blurb. The only other thing that I had to go on was that the person who gave it to me was so liberally applying praise that I was almost surprised she didn't get tongue-tied. I'll admit, the memory of her enthusiastic take on the book was the main thing that stuck, as the blurb was not really enough to make me pick it up otherwise. 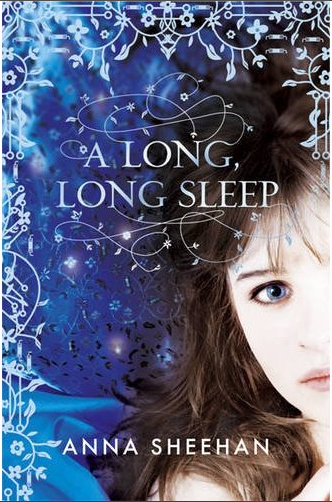 A Long Long Sleep follows Rosalinda Fitzroy, a girl who wakes up from stasis to find that 62 years have passed. Her presence forgotten after the deaths of her parents, Rose must now navigate a world in which not only are her parents and her first love gone, but has also gone through some pretty major upheaval after a series of pandemics have ravaged the human population. While she tries to adapt to this new life, she may have to confront what is left of her past before one of the remnants comes back to take whatever she has left to lose. Holy cow, I did not expect this to be so good. It's a bit of a slow start, as both the reader and Rose have to get used to a strange new world that we've been basically dropped in, but the writing is surprisingly engaging and lures you in slowly but surely. By the end, I was crying like a little girl. That might well be because the ending decides that after all the excitement is through, it'll batter what's left of you with all of the feels. ALL of them. It is a tad on the predictable side, although I wasn't able to completely foresee all of the twists, so it kind of met a nice balance of surprise and making me feel smart. The only real problem I have with it is that some of the plot's details are revealed towards the end in a way that doesn't make much sense; it kind of feels like the author got stuck on how she was meant to reveal the main bad guy and applied a liberal dose of handwaving and desperate hope. The characters are the main strength of A Long Long Sleep, and it's the desire to see them come out okay that makes it as emotionally powerful as it is. The three main people to talk about are Rose and her two school friends, Bren and Otto. I could talk about her first love, Xavier, but that could very easily stray into spoiler territory, so I shall refrain from doing so here. Rose is our main protagonist and the narrator of the majority of the novel. She starts off very fragile and passive, qualities that I first assumed were because of the shock of waking up to find that over 60 years have passed. But as the novel goes on, you begin to realise that there's a lot to Rose's personality that she denies herself and the main plot largely corresponds to her internal journey to understand what made her this overly passive, self-loathing person and how to grow out of it. The descriptions of what made her this way were probably what endeared her to me most, because, while I may not have gone through situations anywhere near as awful as she did, I completely understand what it feels like to think that you're worthless after people tell you this constantly. It's not a comfortable journey to read about, but I personally found it to be an incredibly cathartic one. Possibly the most fascinating character is Otto, a boy who was part of an experiment involving genetically modified human embryos and has had to fight his whole life just to be considered human. I found him particularly interesting because the combination of the whole "having to fight a legal battle to be granted personhood" and the fact that he is effectively mute, communicating primarily through touch telepathy and instant messaging, reminded me really strongly of some of the politics that I've come across in researching autism and other disabilities. Earlier in the year, I was diagnosed as being on the autism spectrum; since then, I've been looking more closely at a community that I had had tangential connection with all my life, but never really knew a huge deal about. As a result, I've found a lot of politics involving trying to prove to particularly stubborn and bigoted people that autistic people are just as able to live full and healthy lives as their neurotypical brethren and should be allowed to do so unmolested. I imagine that anyone who could be considered disabled, particularly those with invisible disabilities, would find Otto's story particularly engaging, but I can, of course, only speak from my own experience. In particular, I liked the way that his telepathy is handled. After briefly communicating with Rose in this way, he refuses to touch her throughout most of the book, because he finds her mind frightening and overwhelming. It very much reminded me of the reactions that I've gotten in response to sensory overload and that deliberate withdrawal from the offending stimulus felt very real to me. The only one left to really discuss is Bren. He was most definitely the weakest out of the main characters. He's an overall nice guy, dependable, reasonably pretty. He fit the kind of Prince Charming role and had the hint of an underlying inner conflict about what he wants his future to be, but he seemed kind of underdeveloped compared to Rose and Otto. Basically he's inoffensive but bland.